Ever since the announcement of NTR Biopic was made, it has created immense buzz. Well, not surprisingly, it is also an ambitious venture that is being made as a bilingual film. Considering how grand the film is, it will also feature some renowned names from the industry, from Nandamuri Balakrishna to Vidya Balan to Rana Daggubati. For the ones who has been following the updates, they would be aware that Rana essays the role of current Chief Minister of Andhra Pradesh, Chandrababu Naidu. Now, recently we got a glimpse of his avatar through a leaked picture. 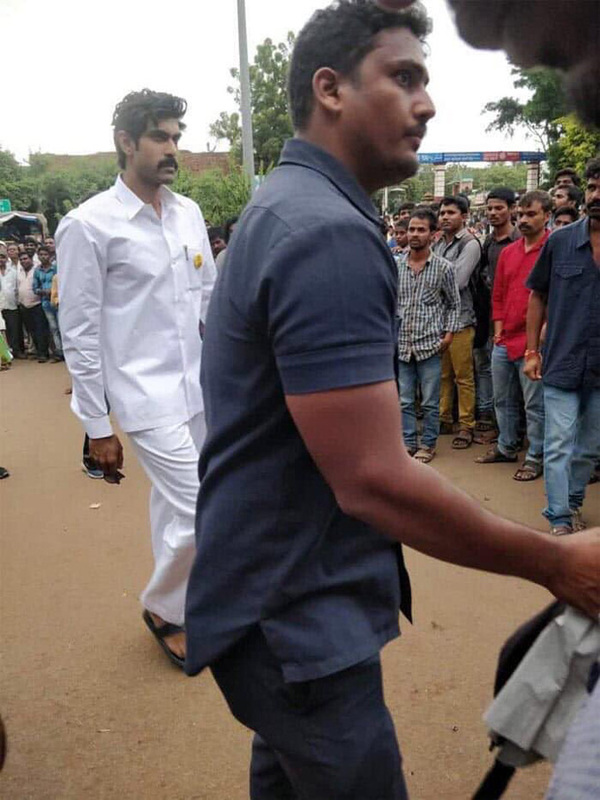 From what we hear, the image of Rana Daggubati dressed in an all-white look from the sets of the NTR biopic has been doing the rounds on the internet. And if reports are to be believed, the picture got leaked during the weekend when the actor was shooting for the role in Hyderabad. Nevertheless, we must say Rana looked quite suave as NTR’s son-in-law in the picture. Not too long, it was being said that the NTR Biopic was being shot in Nandamuri Taraka Rama Rao’s residence in Abids. During the same, Rana Daggubati had expressed his happiness of having received an opportunity to shoot in such an iconic location. Not just that, he was also thrilled to work on such an important project and for also being able to play an integral personality. Rana Daggubati did extensive research to shoot for the film, including the fact that he went to meet Chandrababu Naidu for the same. Coming to NTR Biopic, the film is said to star Vidya Balan as the actor-politician’s wife Basakavataram, Rakul Preet Singh as one of his most famous co-stars Sridevi amongst others and it is directed by Krish Jagarlamudi.